Note that you will have to separately make a reservation for a room at the hotel. The hotel rate should be $139.00 (plus taxes, which will be added) per night. You can reserve a hotel room at the conference hotel, Loews Ventana Canyon, using this link or by calling the hotel at +1-800-234-5117 (and be sure to mention ACM/SPLASH). Even after the early registration deadline you should still be able to make a reservation with the hotel. Loews is still accepting reservations for the nights of October 21-24, which are what you would need for the main conference. However, the Loews Ventana Canyon hotel is fully committed for the nights of October 19, 20, and 25, so if you want a room for one of those nights they can only put you on a waiting list. If you are staying over some of the nights that the hotel is sold out for, then you might need to stay outside of the conference hotel at another hotel (follow the link or see below) during some nights. For transportation from the airport (and returning to it), we will have a van service running at a few times from the Tucson airport, details found in the registration system. Taxi service costs about $60 each way from the airport. It is also possible to rent a car and drive to the hotel. Having a car may be useful if you would like to be able to eat meals at other places besides the hotel, but it won’t be necessary. See also details about the SPLASH shirts that are available for sale when you register. 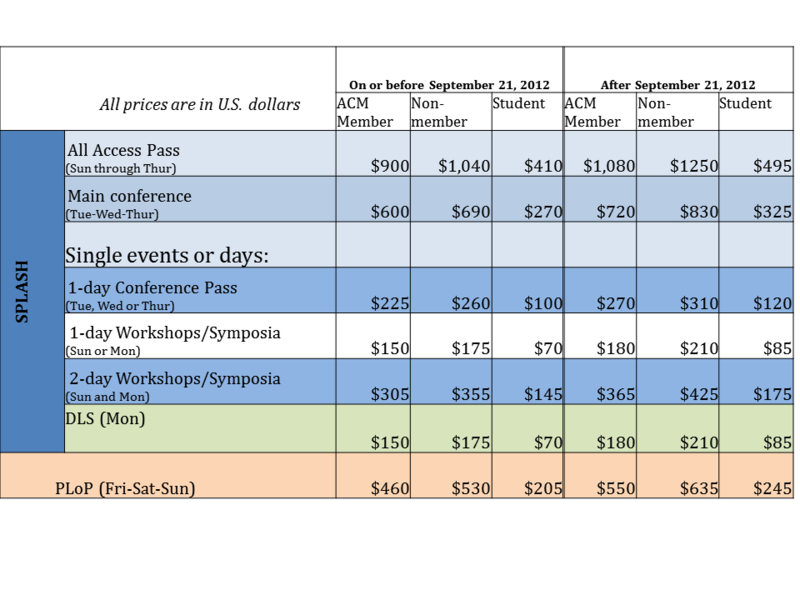 The registration cost are as follows.